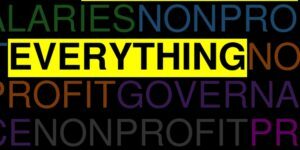 Here you will find every single episode of Nonprofit Everything. Clicking the episode title takes you to the page for that episode, complete with show notes and a way to listen to specific questions. Ah, the double-edged sword of government grants. This week, Andy remembers he has to pay his car insurance, we talk about how to assemble a cash flow projection, Stacey gives some great tips on how to get silent auction items, and we find out whether or not you can put a slow-moving organization’s 501(c)3 on pause. Also, we tackle the ever thorny problem of just where to stick the Volunteer Department. This week, our guest expert Greg Wilken of Endunamo Consulting answers a tough question about firing a long-tenured employee, Stacey (shockingly!) disagrees with Andy about overhead and optimization, and we find out whether or not to take donations from marijuana dispensaries. This week, we find out who should participate in creating the strategic plan, and why you shouldn’t volunteer for your own job. Andy provides the best single thing you can have to get your board to understand your financials, and Stacey shares the secret to winning any kind of fundraising presentation competition. This week, we answer the most frequently asked question of both the Alliance for Nevada Nonprofits and Nonprofit Everything: “How do I start a nonprofit?” Our special guest is SCORE Counselor Bob Cushman. This week, we learn that bi-weekly and bi-monthly may or may not mean different things, Andy warns about the dangers of accepting “a portion of the proceeds” from strangers, we find out what financial information belongs on a nonprofit’s website, how to handle unusual volunteer requests, and how to survive a founder transition. This week, Stacey recommends arm wrestling to help determine a cash reserve strategy, we explain the difference between a fiscal sponsor and a fiscal agent, and get a bunch of great information on social media engagement with expert Heather Curry Frommer. This week, Andy finally shows his true colors about his commitment to the nonprofit sector, we discover that it’s probably already too late to start thinking about Giving Tuesday, and talk about what to do with an unexpected surplus. Plus we get a complicated question about fundraising experience for career advancement, and Stacey shares some great tips about landing a good board position. This week, Andy reminisces about 80s glam rock, we find out the wrong time to talk about board giving, and Stacey shares her best teambuilding secret. We also discuss different kinds of audits and how to deal with a board member intent on ruining your retreat.